Unfortunately I have no new news on Adji. I so wish I did. I had lunch late afternoon with my family so I took the oportunity to try and pick my fathers brain a bit on the Adji case. He could not disclose much of anything to me, he gave me his usual speech of protecting the case and the evidence, as that is one of their oathes, among many, that they take. I was granted just one tidbit of info, and that was that there have been valid tips given to the LE and that several leads have been and are being persued in the search for Adji. I asked point blank, do they believe him to still be alive, the reply that I got was a "yes" with back up explanation that the LE and media made it a point in their coverage to reitterate that Adji is mentally disabled with the mind of a 2 year old and the lack of speech developement. This was done mainly in an attempt to let those that have taken him (if that be the case, which they believe it is) to let them know that they do not have to silence or harm the child. I hope that this helps given the lack of media exposure and news. I wish I could have gotten more, but believe me what info I was able to get from my dad is honestly like getting blood from a turnip. Love you all! Keep hope alive for Adji!!!! Thank you Dolce, for bringing the information that you could about little Adji. It gives us hope. Hi Dolce, Little Adji has been in my prayers daily. I just can't understand why anyone would want to take or harm a child. It is beyond my comprehension. Thank God for people like you and people like Tim. Bless you. No I have not seen the family in person any more recent than those 2 days. My husband and father have though. 2,000 copies of a new full page color poster will help get the word out to keep looking for missing Adji Desir. The 6-year old vanished from Farm Workers Village in Immokalee on January 10th. The fliers will go to the East Coast. Haitian communities in Miami and Fort Lauderdale will to post the fliers their neighborhoods. Lead Investigator Lt. Tom Smith says, after halting the ground search, now his team is filtering through 500 tips. "We've had tips that cover everything from you need to look in the trunk of a red truck to I've had visions of a house with 666. You have to take each one very seriously." What continues to make this case so difficult is direction. Did Adji wander off or did someone take him? Lt. Smith says, "now we are spending time looking at people, at vehicles and doing analytical checks." 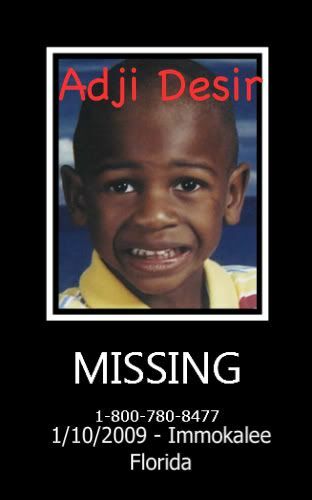 Investigators have re-interviewed the children, some as young as 5-years old, Adji was last seen playing with. Farmer Workers Village only has one way in and one way out. It is very normal for parents to let their kids play outside- even late at night. Collier County Sheriff Office sergeants, patrol officers, and members from the FBI and Florida Department of Law Enforcement are dedicated full time to the Immokalee Substation in the search for Adji. Lt. Smith said there are no similarities to the case of missing Fort Myers child Baby Byran. Baby Bryan's parents first reported a woman kidnapped him, but later investigators determined the parents gave the child back to smugglers. The Adji's family has been cleared of any suspicion in his disappearance. Another challenge, investigators have to work with consulates to communicate with Adji's father who lives in Haiti. The reward for Adji is now at $33,500. "We've just got to keep going until we are at the right place at the right time and the right person tells us something," says Lt. Smith. If you have any information on the location of Adji Desir call CrimeStoppers at 1-800-780-TIPS. Thank you for the update on the investigation Dolce. I remain hopeful little Adji will be brought home to his family. Little Adji is still in my prayers. May God bless and watch over him until he comes home again. I just wanted to let everyone know that I saw Adji's case was featured this week after "With Out A Trace" as the clip..."have you seen this real missing person" and also I see that Nancy Grace is continuing to keep it in the for front of America. I sure hope that there is a break in the case. I find it odd that the reward is now up to almost 35K and still no viable tips. God bring this boy home to his family safely soon! And God bless the investigators and lead them to the path to find Adji. IMMOKALEE: For the first time, we spoke to one of the last people who saw six-year old Adji Desir before he disappeared from Immokalee a month ago. Life in the quiet farming village seems normal. But people who live there will tell you it is anything but. Immokalee resident Jasmine Bell is 18-years-old and old enough to understand how much things have changed on just the last four weeks. "People just more protective of their children," said Bell. "People who used to be out with the little kids, you don't see them out anymore." A month ago on Saturday, little Adji vanished from Immokalee's Farm Worker's Village and Nagwa McKenzie is the last person he played with that afternoon. "He said he was going home. After that, we didn't see him anymore," said McKenzie. "He walked off with his friends. He said he was going home because nobody would let him ride a bike." Deputies and volunteers searched for days, but came up empty handed. "The Collier Sheriff's Office has received 250 tips leading us in a variety of directions - some to people, some to vehicles, some to locations," said Lieutenant Tom Smith with the Collier County Sheriff's Office. But a month later, he says none of those were very solid. But 30 leads are still under investigation. "We have a full-time task force at the Immokalee sub-station. We have six investigators," said Smith. The team continues to work two possibilities on what may have happened - a mysterious disappearance, or a mysterious abduction. "At this point, we don't now if someone took him. He could have been like they say, statistically dead within the first three hours. But the likelihood is that he's with someone," said Smith. The reward in this case stands at $33,000. If you have any information on the whereabouts of Adji Desir, you are asked to call the Collier County Sheriff's Office or Crime Stoppers at 1-800-780-TIPS. Thank you for bringing that over Muffy. Each night our local news tries to do an update on Adji, however I watch each night as the time slot given to him gets shorter and shorter and the information gets repetitive. At the fair this weekend, the county fair, there was a booth set up for the CCSO and Adji's picture and information was featured. I was not able to walk right by the booth as I had done with the others, it stopped me in my tracks thinking of how this child would not attend the fair, how he was without his parents, and how he was probably very scared. The girl manning the booth was handing out the fliers of Adji and I took one and thanked her for keeping his case alive. I know that our SO is pretty tight lipped, for the most part, but the same song and dance over and over causes my hope to slowly fade, but the thought of Adji's Grandmother and Mother still plague my mind, so in my thoughts and prayers he will continue to stay. I have not forgotten him either,......Prayers for him and his family. NAPLES — Life goes on in Immokalee. But as time passes by, Collier County Housing Authority executive director Esmeralda Serrata said she fears people might forget about Adji Desir. The disappearance of 6-year-old Adji from his grandmother’s Farm Worker Village home in Immokalee on Jan. 10 shook the small community. And although the ground search was called off, authorities continue to investigate. According to Becker, the search for Adji has spread through both of South Florida’s coasts with detectives heading to the east coast Monday to deliver additional posters to law enforcement agencies. Becker said the search has concentrated in Southwest and South Florida because of the strong Haitian community presence. Time however, has affected the pace of the investigation. “Unfortunately the number of leads have slowed down,” said Becker. The family however is holding on, he said. Maribel Slabaugh, program manager for the Center for Missing and Exploited Children’s Collier County office, said many people in the community are still asking for fliers. For their part, the community has continued to keep close contact with the Sheriff’s office regarding the situation, said Serrata. She added that the Housing Authority has also kept in contact with Adji’s family. Residents are also being more vigilant, admitted Serrata. The caution has led to kids not being let out at night unsupervised. It’s something that resident Amparo Diaz, 35, said she keeps in mind. “I don’t let them go out anymore,” said Diaz, 35, while doing laundry Monday. The mother of four said that before Adji went missing, she used to let her youngest son walk to Village Oaks Elementary alone. Through it all, she said she could only imagine the grief Adji’s mother is going through. Four year resident Horcene Louise, 30, said some things have remained the same in Farm Worker Village, but that people are being more careful. “We’re watching the kids,” he said adding that the neighbors are making an effort to look out for each other. Louise said that it was especially true of the village’s Haitian community. “The community is like a family,” said Louise, while working on a grey sedan on Grace Court. It’s the community, Becker said, that in the end would make the difference in this case. For more information about the search for Adji Desir visit the Collier County Sheriff’s Web site at www.colliersheriff.org or the National Center for Missing and Exploited Kids site www.missingkids.com. I'm going to move this to the High Profile area to keep it "in the news" at least here at SM. I have other friends as well that I have written to - that have internet true broadcast capabilities - have many listeners through out the US. Gave them Adji's info and his photos. We Need to Bring this Baby Home - He is a Beautiful Child and the Love Light of his Families Life. Great idea Deenie. I am going to post a bulletin myself of this as well to pass it along on my MySpace and Facebook. This just breaks my heart. I can't stand to think of how scared this poor little boy must be, if he is still alive. Thanks for keeping everyone updated on the investigation, Dolce. I think I would check on a lady who had just lost a baby or someone who always wanted one and couldnt have one in this area. It is just my gut feeling that that is what happened to this little boy. I read this entire thread last night before I went to bed. Where is this poor little boy, Adji?. It was heart wrenching to see the pictures of his Mom and Grandmom. I pray that they find this little boy soon. It is like he just walked off the face of the earth. Someone had to take him IMO. Page created in 6.14 seconds with 20 queries.